Over four decades, donations have topped $23 million. The Seattle Times' annual holiday drive helps 12 community nonprofits provide everything from meals to homework help, counseling to shelter – and hope. Fai Mathews wakes up each morning without an alarm clock, ready for her early morning job that begins at a downtown Seattle warehouse. She doesn’t need any buzzer to get her up. 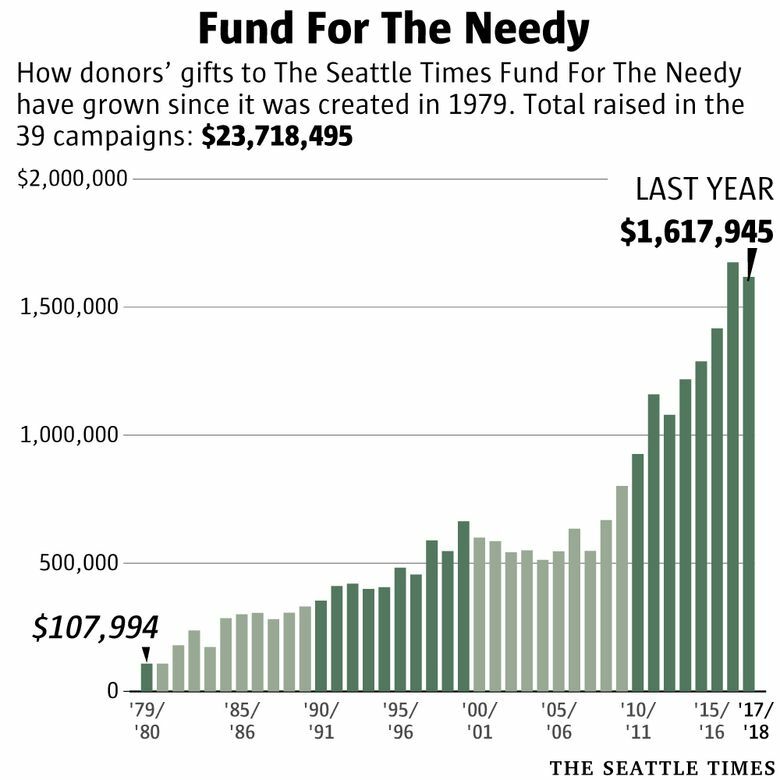 Each year, The Seattle Times Fund For The Needy raises money for 12 charities that help children, families and senior citizens. Throughout the season, The Times is telling how the organizations make a difference in the lives of thousands, and the impact donors can have. Click here to make a tax-deductible donation to the Fund For The Needy. Mathews, a lifelong Seattleite, has worked for Meals on Wheels for 11 years and has delivered thousands of meals to senior citizens across Seattle. Three days a week, she visits at least 23 people, helps them put away their frozen food, and stays for a minute to chat. She helps her clients find other things they need, be it a new mattress or assistance with bills. Once, she helped save someone’s life. The other two days a week, she visits seniors’ homes and conducts assessments for Sound Generations, previously called Senior Services, to help people find services to assist them in an increasingly expensive city. “A lot of them, they don’t get a chance to see anybody but you,” Mathews said, noting Meals on Wheels makes sure drivers have time to briefly catch up with each client. Mathews, 65, is a welcome face. On a Friday in November, she dropped off two bags packed full of food at Legacy House, an assisted-living facility in the Chinatown International District. “She’s a popular one!” said Sally Ding, Legacy House’s operations manager, as she took the bags for clients. 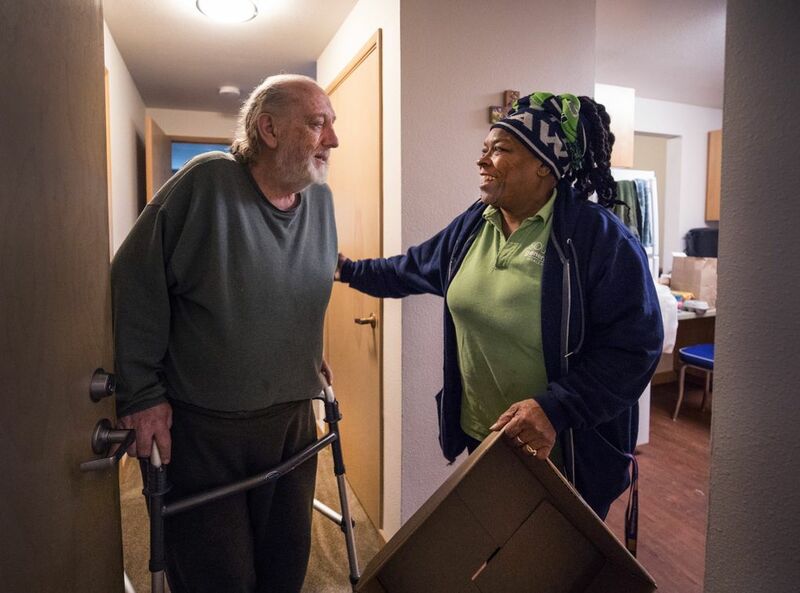 Meals on Wheels is part of Sound Generations, one of 12 organizations that benefit from The Seattle Times Fund For The Needy, the annual philanthropy drive that kicks off this weekend. The fund is now in its 40th year, and during its four decades has raised more than $23 million from readers. Donations from individual community members last year ranged from $1.70 to $30,000. Added together with donations from businesses and organizations across the region, the fund raised $1.62 million last season. A full 100 percent of donations to the Fund For The Needy goes directly to the 12 organizations. The Seattle Times covers all operating costs. 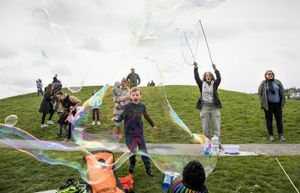 The 12 organizations supported by the Fund For The Needy provide necessary and life-changing services to people in the Puget Sound region, offering everything from emergency shelter to support groups for young mothers to after-school programs for at-risk kids. Last year, Fund For The Needy donations helped Atlantic Street Center support 167 children get ready to start school with pre-literacy programs. Donations aided The Salvation Army in providing after-school homework support to 500 kids. The funding helped Hopelink provide food to 13,700 people at its food banks, and supported Sound Generations in delivering a total of 412,294 meals to more than 2,200 seniors. Meals on Wheels does a lot more besides bring food to homebound seniors, Mathews said. A few years ago, she visited the home of a client she was used to seeing every week. There was no answer at the door. After a few minutes of knocking and calling out, Mathews sought help from the apartment building’s management. They were able to unlock the door, but a chain prevented them from entering. Mathews could see her client on the floor. Help was able to get in, and get the woman to a hospital. She was eventually OK, but had been unable to get up after falling two days before. “You saved my life,” she told Mathews, when she saw her next. It’s times like that when Mathews, who is active in many civic organizations across Seattle, knows how much she and other Meals on Wheels drivers are needed. “You have to have a heart for this job,” she said. 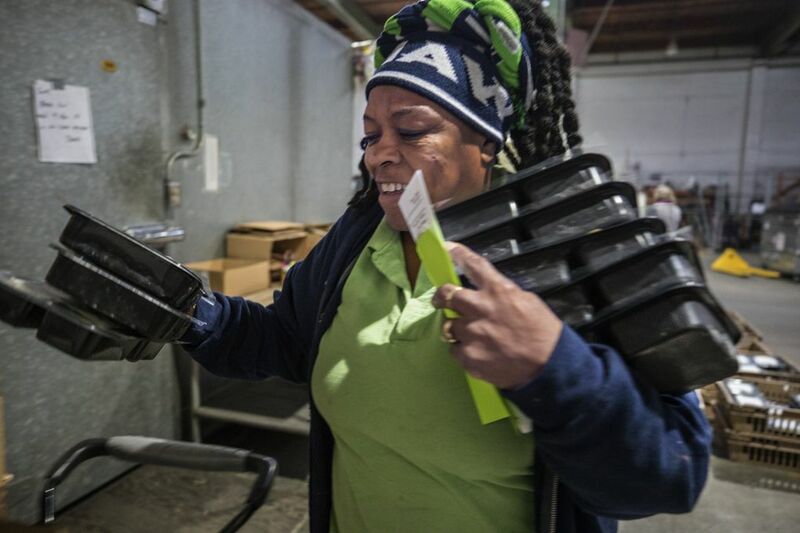 Each morning she drives for Meals on Wheels, Mathews gets to the Seattle warehouse by 8 a.m. and packs dozens of bags full of frozen meals and fresh vegetables. She loads the bags and boxes into the back of her work van, where she also keeps a back brace that she bought a few years ago when the heavy lifting started to bother her. Her first stop on a Friday in October is at a Seattle Housing Authority apartment building in the Chinatown International District. She delivered a week’s worth of meals to Keith Orchard, a new client who signed up a two weeks ago. After a medical procedure, he found it harder to get out and go grocery shopping, he said. Mathews paused to check in with Orchard and make sure he was set for the week. Tai Powell is facing a full day of doing a mountain of laundry. It’ll take him and volunteers more than a day to wash and dry all the clothes that have recently been donated to the Baby Boutique at Wellspring Family Services, he figures. Even so, all the clothes will be distributed to families who need them in the next three days or so, he said. Powell, the manager of the boutique, said donations pour in every day. But Wellspring Family Services, which helps children and families facing homelessness and other crises, always needs more. “It’s a constant battle,” Powell said. 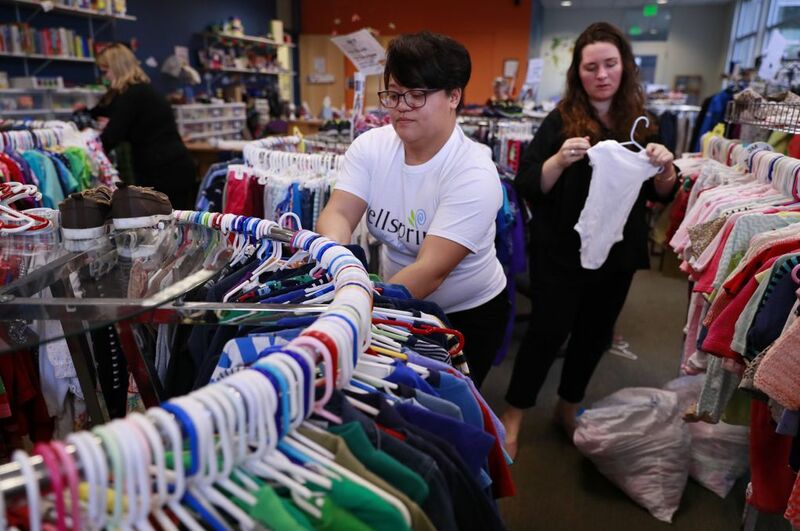 The Baby Boutique, located at Wellspring’s headquarters in the Judkins Park neighborhood, offers clothes for kids from newborns through age 18, as well as diapers, car seats and other necessary supplies for families. The boutique is set up like a store, where customers can browse clothes on racks and bring them to a counter to check out. But no payment is necessary for the families who shop at the boutique, who are Wellspring clients or referred from other organizations. The retail setting helps build confidence in kids when they see their parents shopping. It also gives the family freedom to choose their own clothes, he said. Powell is the sole full-time employee of the boutique, but has a lot of help from volunteers, including from Wellspring’s associate board, composed of young professionals. Sarah Kilpatrick, 36, spent an afternoon last month hanging and sorting clothes for the boutique. She is constantly sending out notices at work at a John L. Scott real estate office, and to her friends to solicit donations. So much so, people now bring her donations without her even asking. “After a while, people just start to pile things at your desk,” she said. Wellspring CEO Heather Fitzpatrick knows that sense of community engagement well. She recently asked neighbors for donations, and ended up with an SUV completely packed full of clothes and supplies. Wellspring helps low-income families with many different programs, including early childhood education and housing assistance. Many people wouldn’t believe how quickly one or two bad situations can cause a family to experience homelessness, she said. “Families that don’t have that safety net, they spiral,” Fitzpatrick said. Wellspring is there to intervene. 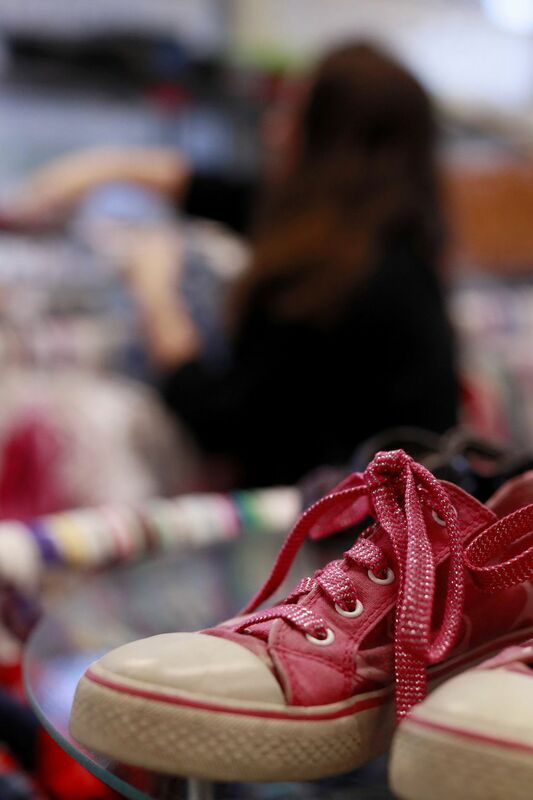 At the Baby Boutique alone, families completed more than 2,200 shopping trips last year. During that time, more than 28,000 diapers were distributed. The best part of the job is getting to help families every day, Powell said. The 12 organizations that benefit from The Seattle Times Fund For The Needy are: Asian Counseling and Referral Service, Atlantic Street Center, Big Brothers Big Sisters, Childhaven, Hopelink, Kent Youth and Family Services, Kindering, The Salvation Army, Sound Generations, Treehouse, Wellspring Family Services, and Youth Eastside Services. This story was updated to reflect the correct Seattle neighborhood where Wellspring Family Services is located.